Dimensions 1.25 by 7.75 by 9.75 in. 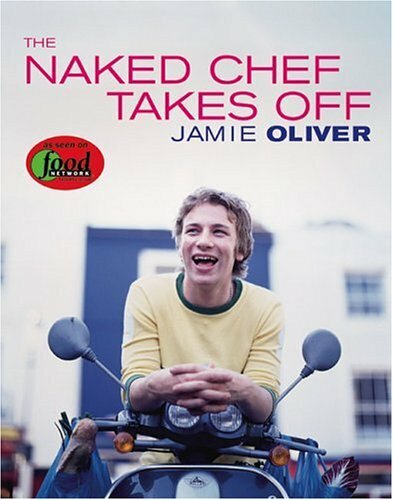 Amazon.com description: Product Description: Jamie Oliver, the Naked Chef, is a culinary star with charm that shines even brighter than his glossy pictures (People). He's the Food Network's latest sensation, a Today Show regular, and a GQ man of the month. His audience appeal keeps growing, and his primetime show on the Food Network continues to reap huge ratings as he teaches everyone the secret behind fresh, simple, delicious cooking. In The Naked Chef Takes Off, TV's hottest young chef (USA Weekend) returns to offer even more delectable stripped-down recipes with basic ingredients and a minimum of fuss. In this new book, Jamie features fantastic breakfasts, tapas, roasts, fish dishes, and desserts to die for. Best of all, each of the recipes is accompanied by Jamie's winning, off-the-cuff commentary and straightforward food philosophy (Los Angeles Times) that will encourage confidence and inspire both new and experienced cooks. Filled throughout with gorgeous photographs of both the recipes and the chef, here is a book to savor and to share. About: Presents an array of recipes for breakfasts, tapas, roasts, fish dishes, and desserts, accompanied by humorous commentary and straightforward philosophy about food.